Hey, It’s the Candy Man! It’s time to share my favorite backselling story. It’s a word coined by John Haskell, a frequent contributor to Agency Sales magazine and author of Profit Rx under his pen name, Dr. Revenue®. Here is my backselling story. I had broken one of the fundamental rules of running a manufacturers’ representative firm. I had let one principal become more than 50 percent of my company’s income. Much more than 50 percent. We were so busy selling the product that it just happened without us noticing it. Once we did notice, we needed to think about ways to make sure that this principal knew how much value we brought to their company; not just the local regional manager, but also the team at the principal’s headquarters. So, we asked to schedule a visit. Apparently, it was the first time one of their reps had asked to visit headquarters, perhaps because the only way to get to their small town was to fly to Oklahoma City and drive 139 miles southwest or fly to Dallas and drive 141 miles northwest. On that drive we realized we had come empty-handed. So, we stopped at Walmart and bought one-hundred one-dollar sleeves of “fun size” candy bars. Arriving at our hotel, I emptied my roller luggage and filled it with candy. You would have thought we were giving away gold bars instead of candy bars. No one had ever come to headquarters to thank them for their help, and no one had ever brought them even a small token gift to thank them. Joe Figueroa points to a singular event that sent him on his way to opening his own rep agency close to 20 years ago. As the president of Latin America Sales Company, Inc., (LASCO) Middleton, Massachusetts, recalls it, “In 1997 a light went on when I was sitting in a sales meeting for the manufacturer I worked for. As they explained how they were going to answer customer calls, I knew I could do the job much better than they could. Simple is always better and simple is just the way Charlie Ingram describes how and what a rep council is. Many times you hear a salesperson say: “We service the heck out of our customers. They’ll never leave us.” But then a competitor walks away with an account. No one saw it coming or what went wrong. Raymond J. Hall, the retired executive vice president and CEO of The Electronics Representatives Association (ERA), died in November. He was 80 years old. Hall was the longest-serving management executive and a member of the association’s Hall of Fame. His tenure at the helm of the 83-year-old organization began in 1969 and extended to 2004 when he started transitioning into retirement. In most organizations, sales managers are the essential bridge between the company’s sales goals and the realization of those goals. The gritty day-to-day interactions between the salespeople and their customers are frequently filtered through the perspective of a sales manager on their way up the ladder. The aspirations and strategies of the company’s management must be imprinted by the realism of the sales manager as they come down from above. Sales managers are the conductors who carefully orchestrate the tentative entanglement of the salespeople with their management. This is the fourth in a number of articles serializing The Sales Force — Working With Reps by Charles Cohon, MANA’s president and CEO. The entire book may be found in the member area of MANA’s website. Over the past three months, my wife and I have been up and down the east coast driving our son to and from baseball tournaments and college showcases. Invariably, each drive back home has taken twice the time it should have because of road construction. On Sunday, Waze, my favorite navigation app, said that the drive would take just two hours and 32 minutes. Four traffic delays because of road construction delayed us for another two and a half hours. 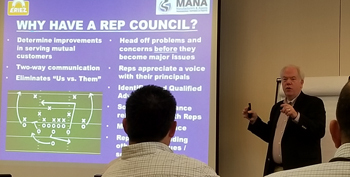 MANA wants to recognize members who have been with us for many years, those who celebrated their 70, 65, 60, 55, 50, 45, 40, 35, 30 and 25 year membership anniversary the previous year. MANA thanks and congratulates the members listed here for their long‑term support and commitment. J. H. Green Sales, Inc. When it comes to the importance of taking your sales team mobile, the numbers speak for themselves. Did you know that outside sales reps are now spending 89 percent of their time selling remotely? And it’s no wonder why. Studies show that mobile customer relationship management (CRM) tools can increase productivity by nearly 15 percent. Mobile CRM technology can certainly work magic — but not without a magician at the helm. After all, implementing a mobile sales strategy is no easy task. It requires planning, proper execution, and the right mobile sales tools. I am a lawyer and not an accountant, so my approach to this topic may differ from attorneys who are also accountants or those who specialize in agreements for the sale of a business. Although this is a serious topic, I tried to have a little fun with it. As strange as it sounds, there are many parallels that can be made between savvy investing and fantasy football. While it’s fun to piece together these make-believe teams and compete amongst friends, there’s a lot to be learned about controlling emotions and managing expectations through fantasy football, and how that ultimately relates directly to investment habits. Allow me to set this scene: At the end of August you’ve drafted what you believe to be a stellar group of football players who together comprise the best team in your fantasy league — at least on paper. MANA CEO Charles Cohon recently visited the University of North Texas to confer with Ph.D. student Trond Bergestuen and his academic advisers Professor David Strutton and Professor Kenneth Thompson about an academic paper and Bergestuen’s Ph.D. thesis; and to speak to Lecturer Terrence Suber’s Professional Selling class. Left to right: MANA CEO Charles Cohon, Ph.D. student Trond Bergestuen, Department of Marketing Chair Jeffrey Ogden, Lecturer Terrence Suber, Professor David Strutton, Past MANA Director John Sandifer, Professor Kenneth Thompson, and TTI Inc. Field Sales Manager Jon Cowley.